Every major city has it’s own area or district that plays home to the diamond trade. London has Hatton Garden, Antwerp has its Diamond Quarter and New York has the Diamond District. Now centered around a single block on W47th St in Manhattan, stretching between 5th Ave and 6th Ave, the district wasn’t always so confined. Although diamonds had been traded in New York since before the revolution, it wasn’t until the 1920s when the industry started to grow beyond its modest foundations on Maiden Lane. Diamond traders began to populate an area near Canal Street and the Bowery and, in the 1930s, a second area of trading sprang up in the financial District. 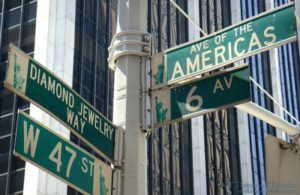 In the early 1940s, the industry made a shift northwards towards its eventual current centre on W47th St, and is home to over 2600 independent diamond and jewelry businesses. Most of these operate within one of 25 exchanges where deals are done from booths and small stores, where a single day’s trading can reach half a billion dollars. A great many of the deals that are made in the Diamond District are completed with a blessing and a handshake, a tradition that was brought by Jewish traders who fled to the US from the dangers they faced in Europe in the 1930s. 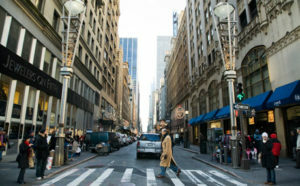 It was this influx of traders which preceded the shift from the several small areas of trading to a single core area, together with an agreement with the City itself to center the trade around 5th and 6th Ave.
Jewish diamond traders remain influential in the Diamond District, and it has made New York the premier gateway for diamonds into the US. It is estimated that up to 90% of all diamonds traded in the US come through New York first, before going on to other trading centers in Philadelphia and Los Angeles. Such is the influence of Jewish traders over the last 75 years, that many of the words and phrases in common use in the district are Yiddish in origin and are used by all nationalities. There is also a smattering of Russian words and others from Eastern European languages as a result of the mass migration to escape from the horrors of the Nazis. In particular, many Dutch-derived words are used, a reminder that Antwerp was – and still is – the world’s largest diamond trading center, with around 80% of all diamonds traded being processes in the city. Although jewelry is bought and sold in Antwerp, as in any other diamond center, the majority of trade centers around loose diamonds. This is in contrast to New York, where jewelry retailers and diamond traders sit and work side by side. New York is one of the world’s leading jewelry centers, a status largely attributed to the diamond trade. It’s no coincidence that Tiffany & Co, Cartier and many more of the finest jewelers in the world are situated just steps from the Diamond District itself. New York has been the largest city in the US for well over 200 years, so it’s only right that it should be home to the largest concentration of diamond traders and jewelers. It’s also right that an industry so steeped in history maintains some of the old ways in a district where east meets west every day, and the results are spectacular.